There has been a rise in the level of radiation detected around the former Chapelcross nuclear plant in Dumfries and Galloway, according to a study. However, the latest Radioactivity in Food and the Environment (RIFE) report found that the levels remained well below UK and European safety limits. The findings are drawn from monitoring radioactivity levels in farm produce, soil and water samples. 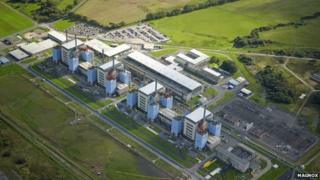 Decommissioning of the power plant, near Annan, began in 2004. The RIFE report found that the radiation dose to the surrounding population was low and had remained broadly similar since decommissioning work started. Of the figure detected, the report said the total represented just 2% of the overall safety limit. The report said: "The total dose from all pathways and sources of radiation is assessed to have been 0.022 mSv in 2015, which was approximately 2% of the dose limit, and up from 0.014 mSv in 2014...Total doses remained broadly similar from year to year, and were low." The report also concluded that only a fraction of the radiation level was said to emanate from Chapelcross itself, with the majority of radioactivity locally attributed to discharges from the Sellafield nuclear complex in Cumbria. Dr Paul Dale, principal policy officer for the Scottish Environment Protection Agency, said: "This year's report again demonstrates that Scotland's public is adequately protected against sources of radioactivity that could impact on our food and the wider natural environment. "The report represents a collaborative effort by all agencies to carry out rigorous annual monitoring, to ensure dose levels are well within international limits and the 2015 report confirms that this remains the case." Chapelcross was Scotland's first commercial nuclear power station. After 45 years of continuous operation, electricity generation ceased in 2004. Final site clearance is expected to commence in 2085 and be completed by 2095, according to the report.